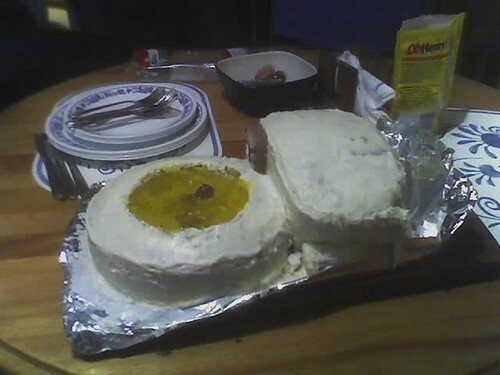 My friends and I have a tradition of baking ugly cakes. Often, when there is an event to celebrate such as a birthday, we will bake such a cake to commemorate it. They are all edible, but have something about them which qualifies them as "ugly". 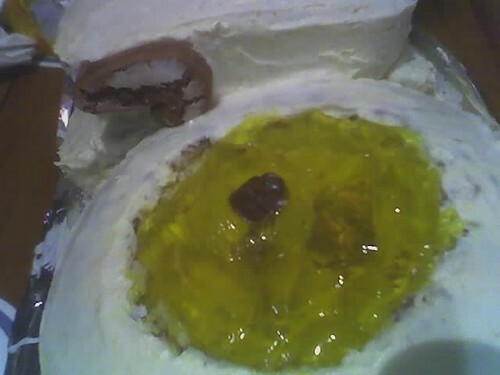 Past examples include a cake with a log cabin made of meat on top of it (for a vegetarian), a cake depicting a car crash in the middle of Africa (including meaty bodies and curious animals), a block of cabbage covered in icing (for the same vegetarian when she didn't enjoy the meat cabin), and an egg-shaped cake complete with yolk and a rubber chicken inside (which I thought was real when I first cut into it). It's a broken toilet, complete with dirty toilet water! I had no part in the actual construction of the cake, but they did a wonderful job of getting the texture of porcelain right. Plain icing wouldn't do, so I guess they put on a layer of hardened icing sugar. Nice. The water is yellow Jell-O, and the poo is replicated by a wet Oh Henry bar. It was completely edible and actually tasted deliciously delicious. 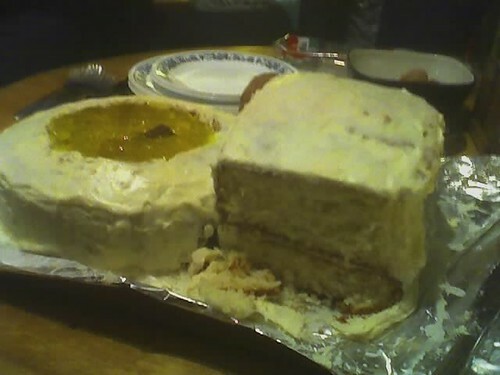 One day I hope to find pictures of old ugly cakes to share with the interweb. There will also be more in the future, I'm sure. Vegetartians are not of this world. Holy f*** that was disgusting. 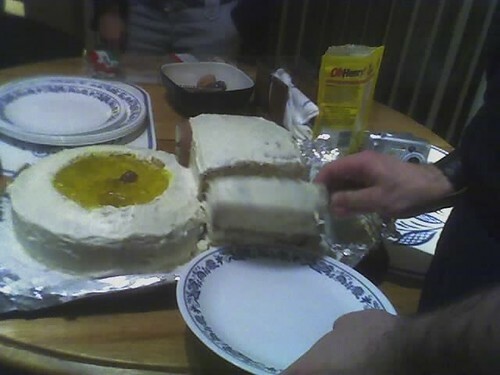 I may have to steal the "ugly cake" idea for some friends of mine. Great idea. Did they hug so tight that Mr. Stork may come by for a visit? ewwww... that's awesome and hilarious, but I would not eat it. that's quite extravagant for a joke. oh grad students and the rigorous extent they will go to for a dumb joke. that's why you're a geek. i'm not though. He just might! Then there would be another cake to celebrate with. 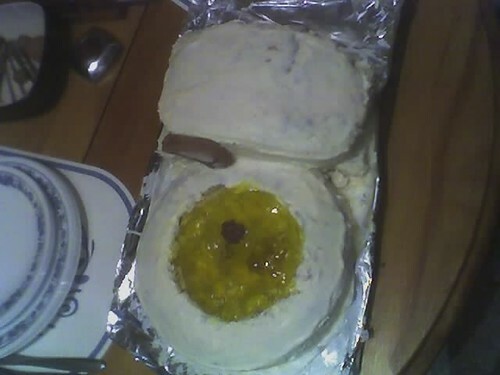 I'm already thinking of ideas...aborted fetus cake? No, how about an accurate depiction of the female reproduction system (complete with lifelike edible fetus). I'm so hungry from not eating right now that the cake looks delicious to me. Not eating is also on my list of things that make me hungry. 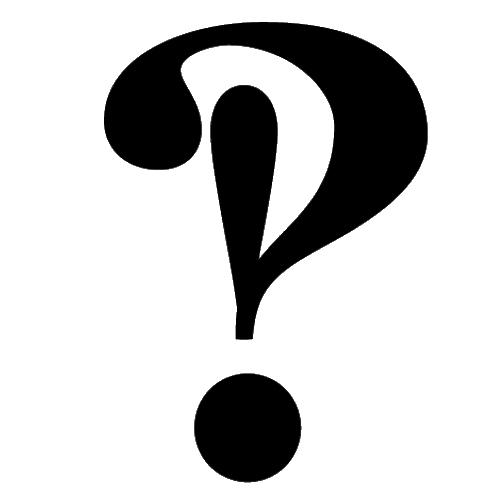 I wonder if this is a commonly observed action and correlation. OK. I read the first sentence or so and was ready to go all 'somebody makes you a cake and you say what?' 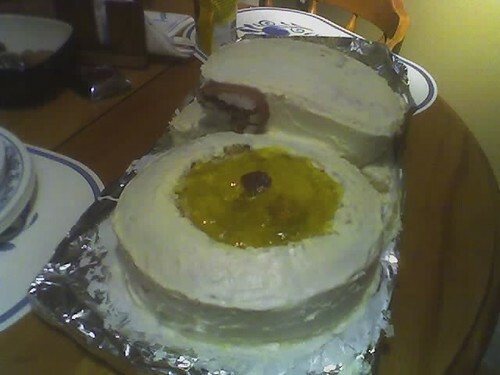 but that really is a bloody ugly cake. I actually almost gagged a little bit. "special hug" i love that.